There's no question that Sony or Canon video recorder series are tough to beat when it comes to HD video record. Ability to convert recorded high definition video for playback on media player or portable devices, further video editing aside, a big chink in their armors is the lack of flexibility to record 1080p HD full screen activity seamlessly, like game footage, tutorial, music etc. That's why HD video recorder software makes sense. Serving the purpose of capturing video in high quality, record video from webcam, much lower-priced or even free but multi-functional HD video capture software provides quick video conversion, edit and even playback. At least one program listed below will satiate your needs. We all know that VLC is a media player, but one of its hidden features we may ignore is video recording. It is free, open source and cross-platform, available for Mac OS X, Windows, Linux. It is useful in various ways, simply edit video, convert video, play video. To record HD screen video, head to Media > Open Capture Device > Capture Mode, and select "Desktop", then modify the frame rate, 15-30 f/s is good enough, next, select "Convert", in the "Profile" dropdown, choose MP4, lastly, choose a location to save the file and click Start. Obviously, it is not designed as a professional HD video recorder, sometimes you'll be troubled by no video or audio issues, poor output video quality. CamStudio is a feature-rich HD video capture software that is free, open-source and simple to use. Screen annotations and effects options are its big highlights. You can annotate video with text, shapes, objects, add watermarks and captions, etc. as you like. It is important to note that this HD screen recorder is Windows-only and saves video in merely AVI and FLV formats, while few portable devices play FLV video. Worse still, this HD video screen recording software lacks the ability to record video with webcam. Plus, some reviewers complain about malware, spam and virus, video audio out of sync. Serving as perfect screen video recorder, webcam recorder, video converter and video editing tool, that's why MacX Video Converter Pro is titled as the Swiss army knife of HD video recording software. 1. Seamlessly integrated with High Quality Engine and Full Screen mode, the 1080P HD video capture software can easily record screen video of game footage, movies, video clips etc. as well as record video with webcam remaining untouched quality. 2. Equipped with hyper-threading technology, the HD screen recorder brings you surprisingly fluent UHD video recording performance with less CPU consumption. 3. As a talented HD screen video audio recorder, it allows you to convert recorded HD videos (4K included) to MP4, AVI, MOV, MKV, etc. over 180 video formats or to Apple Android devices (420+), which means you are free to upload recorded HD videos to YouTube, Facebook, or play them on iPad Air 2/Mini 3, iPhone 6/Plus/7/8/X/XR/XS, etc. with no format compatibility issues. 4. Edit feature is a plus. With this top-rated HD video recording software, you can clip video, crop video frame size, merge videos, add watermark or subtitles to customize your high definition videos, and many more. Free download HD video recorder software and run it. Click "Screen Recorder" button on the main interface. Choose a destination folder to save the recorded HD video file by hitting "Target Folder" button. Click "Start Record" button to start the work. The HD video capture software will help you get original video audio quality. Note: You can select "Keep Full Screen" or "Crop Region". Moreover, you are free to adjust frame rate, video quality or add sound effect to your video, etc. 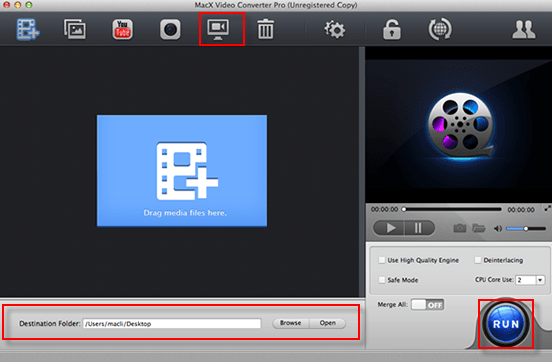 If you wanna record HD screen video on Mac with a webcam using this top video capturing tool, please refer to video recording with webcam on iMac MacBook tutorial. Think that's all? The stunning HD video recorder is also serving as a YouTube video downloader to download HD 4K video music, movies, TV shows from YouTube, as well as Facebook, Dailymotion, Instagram, Vimeo, Vevo, Myspace, over 300+ video sharing sites at full speed.